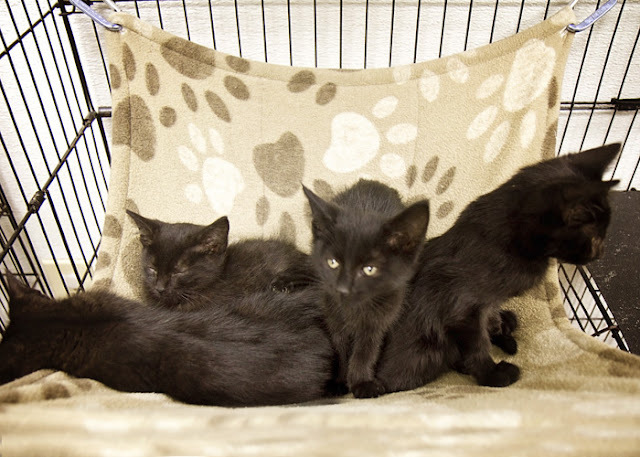 These are just a few of the many black kittens who are available for adoption at the Humane Society of Noble County. There are probably at least 10-12 black kittens, as well as several beautiful black adult cats. Black cats are often overlooked because of the superstition that they bring bad luck. But that's as silly as saying that orange M&Ms bring bad luck, or that it's bad luck to drink water at 10:00 on Wednesday morning, or some other crazy belief! Because of the excellent care and love that these cats have received at the shelter, they are some of the sweetest, most loving cats you could ever hope for. Please come visit them and see for yourself that these black kittens and cats would make excellent pets, and consider giving one or more of them a forever home! This tiny fur baby is Inky, and he is one of many kittens who are available for adoption at the Humane Society of Noble County. Inky is a long-haired black male who is 9-10 weeks old. He is up-to-date on vaccinations and has been at the shelter for about 2 weeks. Inky is a little lover! He likes to be held and petted and likes to play. He was very cooperative when I trimmed his nails and cleaned his ears! He has a very loud purr for such a small fluff ball! Please come visit all of the kittens, adult cats, and dogs at the shelter. You will surely find one to fit into your loving home and family! This adorable little munchkin is Carter, and he is available for adoption at the Humane Society of Noble County. He is a short-haired male orange tabby with a white chest and white feet. He is up-to-date on vaccinations. Carter is 9-10 weeks old and has been at the shelter for a couple of weeks. He is very sweet, loves to be held and petted, loves to explore, and has very loud purrs for such a small boy! Please come visit Carter and the many other kittens, adult cats, and dogs who are waiting for their forever home. One of them will be the right one for you! These two lovely ladies are Cassie and Capri, and they are available for adoption at the Humane Society of Noble County. Both are up-to-date on vaccinations, and both have been at the shelter for almost 4 weeks. 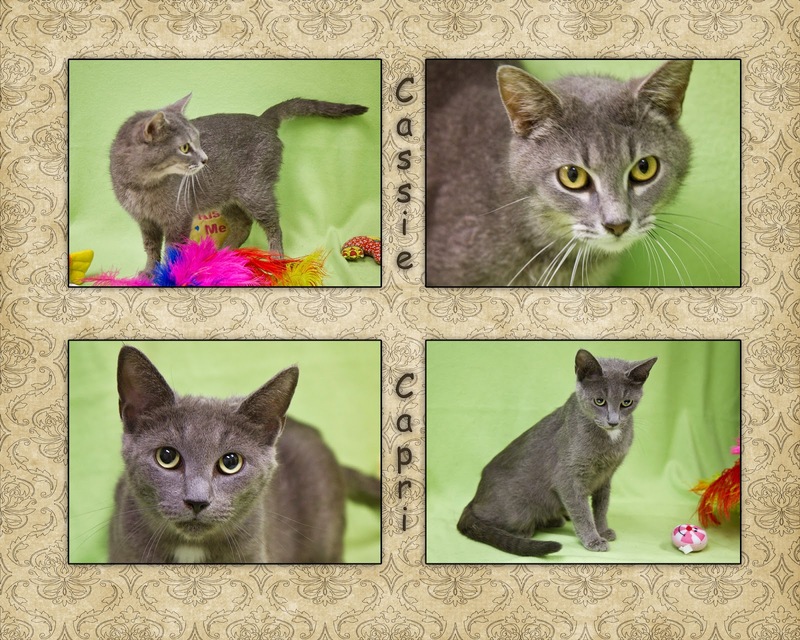 Cassie is a short-haired gray female with tan ticking and big green eyes. She is 1-2 years old and a little on the small side. Cassie is a very sweet girl, loves attention, and has a very loud purr! Capri is a short-haired gray female with a white spot on her chest. She is approximately 2 years old and is extremely sweet and cuddly. And look at those expressive eyes! 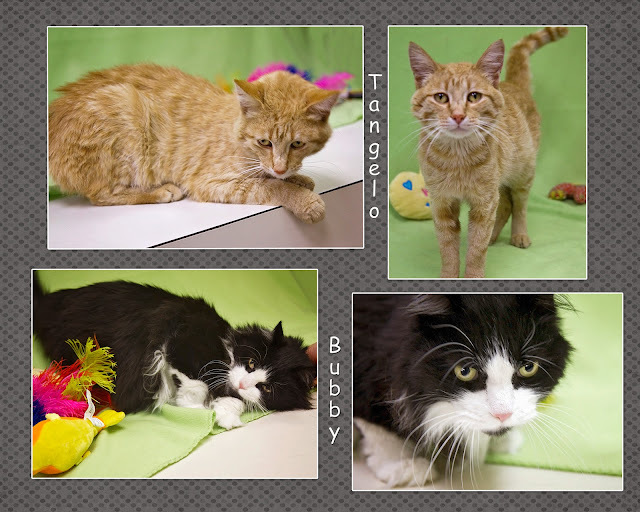 Tangelo & Bubby are today's handsome boys who are available for adoption at the Humane Society of Noble County. They are both up-to-date on vaccinations and have both been neutered. Bubby is also front-declawed. They will receive microchips before they leave the shelter. Tangelo is a short-haired orange and white male tabby who is 1-3 years old. He has been at the shelter for a little over 3 weeks. He is a very sweet and affectionate cat and loves to cuddle. He is on the small side, but he makes up for that with his HUGE purr! Bubby is a long-haired black and white male of undetermined age. He has only been at the shelter for a couple of weeks. He is also very loving and cuddly, and during the photo session he just wanted to be petted. His loud purr definitely showed his approval! Please visit these two boys and the other wonderful pets who are awaiting their forever homes. You could be a savior for one or more of them! 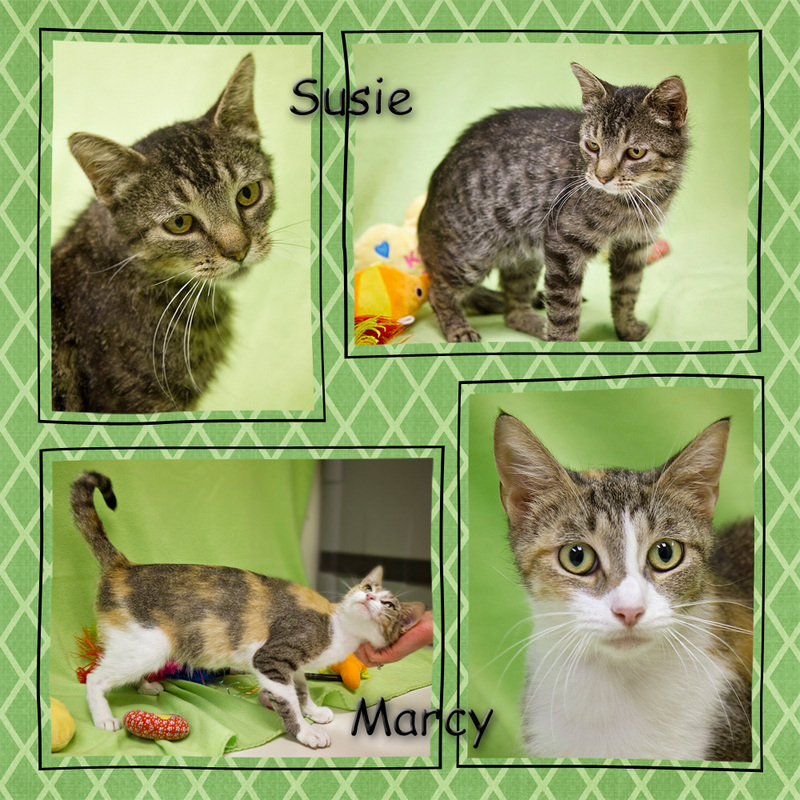 Meet Susie and Marcy, two pretty girls who are available for adoption at the Humane Society of Noble County. Both are up-to-date on vaccinations and will be microchipped before they leave the shelter. Susie is a short-haired black, silver, and tan tabby who is 1-2 years old. She has been at the shelter since April. She is very loving and likes to be held, petted and brushed. She is a fairly small cat and would be lap cat for sure! Marcy is a short-haired calico with white feet, chest, and tummy. She is approximately 1 year old and has been at the shelter since March. Marcy has tested FIV-negative. Like Susie, Marcy loves attention! As you can see from her first picture, she wouldn't even stay in the "photo booth" - she just kept seeking out the hand that would pet her! Both of these girls and many other animals at the shelter would make fantastic pets! Please come visit and see which one should be yours! 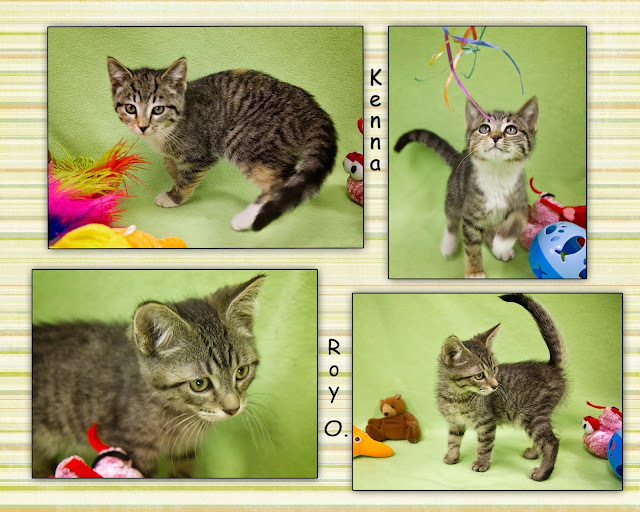 Kenna and Roy O. are two of the MANY kittens that are available for adoption at the Humane Society of Noble County. They are both around 4 months old and are up-to-date on vaccinations. Kenna is a short-haired female black and tan tabby with a few orange patches. She has 4 white feet and a white neck, chest, and tummy. She is a very sweet girl. She is playful and curious, as most kittens are, but she also loves to be held and petted! She has been at the shelter for a little over a week. Roy O. is a short-haired male black and tan tabby with a prominent M on his forehead. He is curious and likes to explore, but also loves attention and can be very cuddly. He has been at the shelter for about 3 weeks. Please consider giving these kittens (or any of the other fantastic animals at the shelter) their forever home. They are counting on you!! Here are Jewel, Marquesa, and Silvara, who are available for adoption at the Humane Society of Noble County. Jewel didn't want to look at the camera, but Marquesa and Silvara are both saying, "Choose me!" Just look at their beautiful eyes! All 3 of these girls are up-to-date on vaccinations, and all have been at the shelter for less than 3 months. Jewel is a short-haired calico/tabby mix who is 1-2 years old. She is a little shy about her new surroundings, but she loves attention and wanted to explore a little bit. 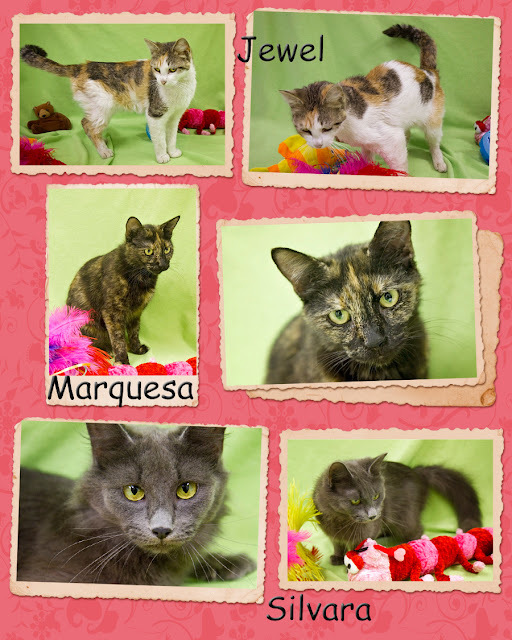 Marquesa is a short-haired tortie who is 2-4 years old. She is learning how to get along with other cats and she loves human attention! She also likes to explore. Silvara is a long-haired gray spayed female who has also tested FIV-negative. She is 3-5 years old. She is a sweet cat who likes attention and also likes to explore. Please come visit all the animals at the shelter and choose one (or more) to be yours! 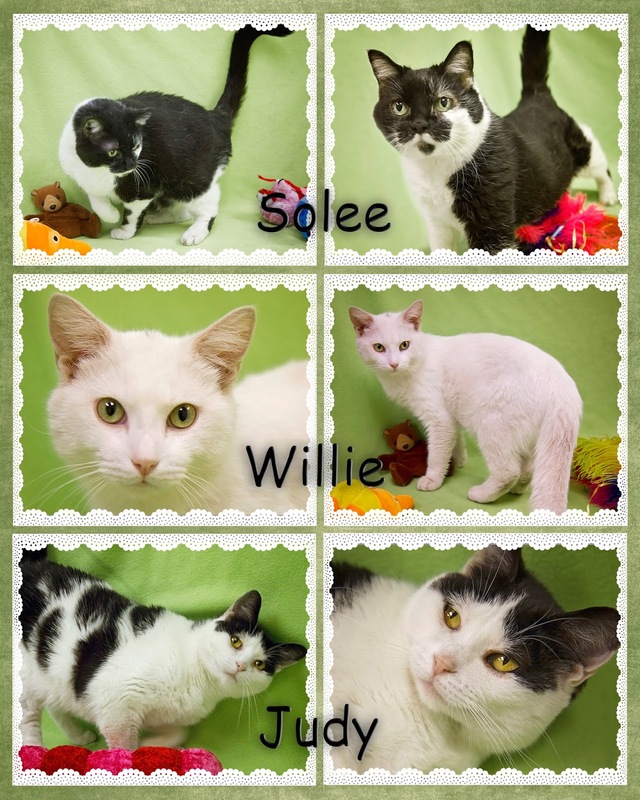 Meet Solee, Willie, and Judy, three beauties who are available for adoption at the Humane Society of Noble County. All three are up-to-date on vaccinations. Solee is a short-haired black and white girl who is spayed and front-declawed. She is 3-5 years old and has been at the shelter for a little over a month. She loves attention and would make a wonderful, cuddly pet! Willie is a medium-haired white male with a few black hairs on the top of his head and in his tail, as one of the pictures shows. He is very sweet, laid back, and calm, and he loves chin rubs. He is 2-4 years old and has been at the shelter for a little over 2 weeks. Judy is a short-haired black and white female who is spayed and 4-foot declawed. She is very sweet, loves attention, and purrs loudly! Judy is 2-3 years old and has been at the shelter for about a month. These cats and many others are waiting for their forever homes. Please come to the shelter to visit them and let one into your heart and home!